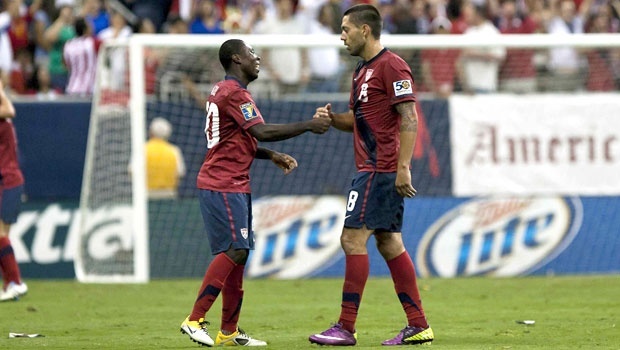 What now for free agent Freddy Adu? He’s one of the most famous footballers USA has ever produced, yet at age 24 he finds himself looking to join his tenth club. We all know the story of Freddy Adu, branded the ‘next Pele’ at 14, went out with pop singer JoJo and was earning a salary of $1 million. The Ghanaian-American spent three years in MLS for D.C. United and Real Salt Lake before his highly anticipated European move. Adu found himself at Benfica for a fee of $2 million. 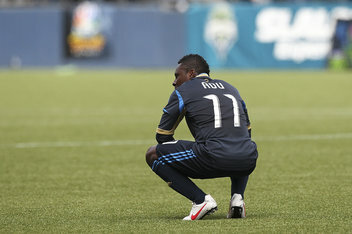 After only two goals in 11 appearances Adu was loaned to various European outposts (including A.S. Monaco) on his way to completing his comeback to MLS in 2011 for Philadelphia Union. Looking at the raw statistics, Adu scored seven goals in 34 appearances, contributing a miserly two assists. On April 5th this year, Adu completed a move to Brazilian Serie A side Bahia in exchange for ex-Manchester United attacking midfielder Kléberson. On November 7th it was announced he was to be released after only five appearances, no goals and no assists. Why? The reason for this being ‘technical deficiencies’. He does not play because there are others who are superior. A harsh statement. Is it a fair one? Let’s just take a few moments to remember those few brief sparks of brilliance that Adu had shown in his time at Philadelphia. Ok so Adu never lived up to the hype of becoming one of the world’s best ever players, plying his trade at one of the footballing elite and earning the millions of dollars a year that was supposedly going to be laid out in front of him. It is worth remembering though that this is a player who has been named in the MLS All-Star team twice in 2006/2008 and has played excellently when putting on the USA shirt. In 2012, Adu was captain of the US U23 Olympic team where he scored four goals in total in the three games in which he played, leading all players in scoring, and was selected to the tournament Best XI. In 2011 Adu was included in the Gold Cup Squad where he played crucial role in the semi-final game winning goals as well as being critical in the two goals that USA scored in the 4-2 final loss to Mexico. Going back slightly further, Adu’s performances at the 2008 Olympics were described by critics as ‘World-Class’. Back in 2012, Adu made #19 on MLS’ 24under24 series – hardly a remarkable feat. What stood out though was the opinion of the coaches and technical directors on how they feel about Adu’s ability. They quickly pointed out that the weaknesses of Adu’s game were his lack of defensive contribution and ability to find consistency. Having said this, one line in particular was pertinent when describing the strengths of his game: ‘Technically he is fantastic. He can beat almost anyone one-on-one’. A vastly contradictory statement to the one released by Bahia. Adu spent 1-and-a-half seasons at Philadelphia. He spent most of his tenure as a left winger. If Adu is supposedly a ‘luxury player’ which most believe him to be and has great technical ability, then why is he being played out wide where defensive contribution is so important? Particularly in a league which records one of the highest turnovers in possession per game. It seems obvious that if you have a player who lacks in defensive contribution but great vision and technique then he should be played as a number 10. Adu has always been at his best when played at this role yet the pragmatism shown by coach John Hackworth meant that a flat 4-4-2 was favoured over say a 4-2-3-1. No Philadelphia player during the Hackworth era (started in mid 2012) has been given the time to take the number 10 position as their own with not only Adu falling victim to this but also diminutive Colombian Roger Torres, who is reportedly on the verge of being released while Gabriel Farfan was traded to Chivas USA in the summer (although could play other positions). Kléberson has shown promise when given the chance to play at the point of the diamond, but Philadelphia have now stated their intentions of purchasing a ‘premier attacking midfielder’ suggesting his time may be limited or even up. Perhaps if Adu was given more time to work on one of his weaknesses – consistency- then the role may have already been filled. Adu’s time at Bahia looks to have been wasted with nothing to show in his move where he seeked to revitalise his career once again. He is an enigma in the sense that he may be one more to satisfy those who believe in the aesthetics of football over the raw figures – the subjective over the objective. There are few other examples of players who can say they have played for 9 different clubs over 3 continents at the age of 24. He is a man noted for his humility and maintaining a high level of professionalism, even Anderson Barros could not fail in mentioning that. Experience is therefore a trait that Adu exhibits over all else. Wherever he goes next on his journey there is no doubt he has to seek reduced wages when looking for his next move. He was a on a salary of allegedly $500,000 minimum while in Pennsylvania and was a large factor for his departure so that cap space could be made up. 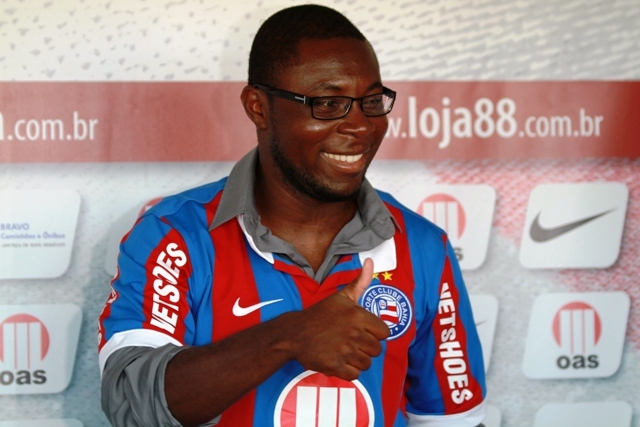 His disappointing time at Bahia simply cannot justify that figure. We all know Adu is not a football prodigy. What he is though is a young, free agent with nine years professional experience who has already had to contend with the expectation at both national and international level. The brief moments of magic he has shown in that time and the still small, glimmering signs of potential raises the question – why not take the gamble? The kid has talent, I watched him play at Benfica. He just needs to find a coach that can work on his mindset. What “REVOLUTION” would this be then Lim? This is a sensible and well argued piece, however the key issue that is not addressed is that on eight occasions since leaving DC United coaches have seen enough in Adu to offer him a fairly generous contract (and in Benfica’s case pay a transfer fee) and yet in every case except the Turkish 2nd division he has hardly played at all. This simply does not make sense, coaches must have seen video’s and looked at him in trials before signing him, so they know the player they are getting. This surely is the real question, how can they all be getting it so wrong – or is something else going on ? As for his failure to establish himself, the football world is full of players who shine brightly in their teens but fail to make it at the top level often not even staying in the professional game. Take a look at past line-ups of any international schoolboy or youth team to verify that. Unfortunately, Freddy Adu is probably just a higher profile one of those, but has been able to use his reputation to stay in the limelight a little longer. I think Adu has had his share of bad luck as well. I saw every game he played at Benfica, and he was not bad. He did not get a lot of time in the pitch, but always did well, and aside from his 2 league goals, scored a couple of important cup goals. I hope he eventually finds consistency and a club he can settle at.